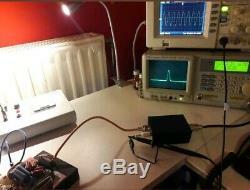 HF LINEAR AMPLIFIER BOARD 500W WITH AUTO BIAS V2.0. AUTO BIAS SUPPLY:12-13.8V. MOSFETS:2x SD2933 PUSH PULL. Idq 700mA each mosfet , total 1.4A. PACKAGE INCLUDE SCHEMATIC AND INFORMATION GUIDE. THIS IS V2.0 AND HAVE BEEN MADE SOME IMPROVEMENTS TO THE AMP. AUTO BIAS MEANS THAT WHEN TRANSMIT (TX) THE BIAS AUTOMATIC GOES ON AND WHEN IN RECEIVE MODE (RX) GOES OFF SO THE MOSFETS ARE OFF AND THERE IS NO CURRENT FLOW THIS WAY THE AMPLIFIER RUNS COOLER. A temperature regulated bias circuit and a high power low loss wide band transmission line type transformers are used in this device. YOUTUBE CHANNEL: DX WORLD ELECTRONICS. ANY MORE INFORMATION PLEASE CONTACT ME. The item "HF LINEAR AMPLIFIER 500W 1.5-30MHz v2.0" is in sale since Monday, February 18, 2019. 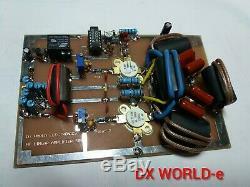 This item is in the category "Consumer Electronics\Radio Communication\Ham, Amateur Radio\Ham Radio Amplifiers".e" and is located in thessaloniki. This item can be shipped worldwide.